Does anyone know for sure if this card received a fix? I swear part of the reason I didn't play Giant Mage in Naxx was because of the inconsistency of this card. As far as I remember Levidz (Naxx launch) was correct. I remember looking it up as well. But sometimes it would duplicate by order of play, not position, like vanish. I gave up because both occured in my games back then and duplicating the wrong minion was a sure loss for the deck. I think it was good, but not tier 1 good. Excuses, anyway. If anyone from this era has an answer that would be awesome because it's like that information (mis-information) never existed. And it seems to work properly now by order of play. Assume you have this secret played, you also have several low health minions in play. The next turn the opponent plays something like holy nova or arcane explosion and kills them all. which minion would be chosen to duplicate? Opponent Mage's Explosive Runes doesn't trigger my Duplicate secret (they kill my minion but I don't get duplicate copies). Maybe that's because Duplicate doesn't trigger on your turn? Yes - in the same manner that a gold Mirror Entity with give you a gold copy of the opponents played minion. Duplicated Dr. Boom finally after dozens of matches and the first thing my opponent decided to do after the second Dr B was Holy Nova and take 13 damage to face and concede. I think this is Grand Magus Telestra from the Nexus encounter in WoW.? Yes it is! Nice catch. Just played against this card. The mage was able to get 4 Bloodhoofs in their hand, for a total of 5 played. Card seems a bit too good, but that may be just because I got rocked by it. A way to recycle creatures. This seems sweet with an argent commander kicking the bucket. I especially like him after a kirin tor mage, because of the mana efficiency and that a 4/3 for 3 was already better than expected. Do note that you can play around him with certain classes. Be mindful of playing against mages and shamans that you don't end up with sheep and frogs. Secret: When a friendly minion KILLED, put 2 copies of it into your hand. This card could end up being played by Mad Scientist on turn 2. 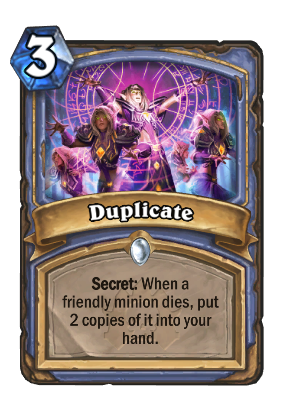 If he's killed during your opponent's turn, you'd end up with 2 mad scientists in your hand and potentially run out of secrets. If they were ice barriers and ice blocks, that's fantastic. If they're anything else, that would be a bad scenario. If he whiffs (no secrets left), then you duplicated an extremely lackluster card. my opinion: Not synergistic with mad scientist unless you run precisely 1 duplicate and at least 2 ice block/ice barriers. The one first summoned, like Redemption, I would guess. Thanks for that! very good info!